Keep and store your vegetable or fruit in our vegetable keeper! This vegetable keeper is uniquely designed to keep fruits and vegetables fresh longer.We different vegetable keeper in different types and shape.Also We have different food storage set.You can order individually or a whole set.A container set including 3 different shape vegetable keeper.If you want,please contact us.Perfect for vegetables,fruits and more.Keeps fruit, lettuce, and vegetables fresher longer.Results may vary depending upon produce and use. Keep produce fresh up to 80% longer with vegetable keeper and Saver. With its built-in Fresh Vent lid filter, these perfectly-sized food containers regulate the flow of oxygen and carbon dioxide to provide the best environment for maintaining fresh produce—and longer-lasting produce means fewer trips to the grocery store, and more savings for you. 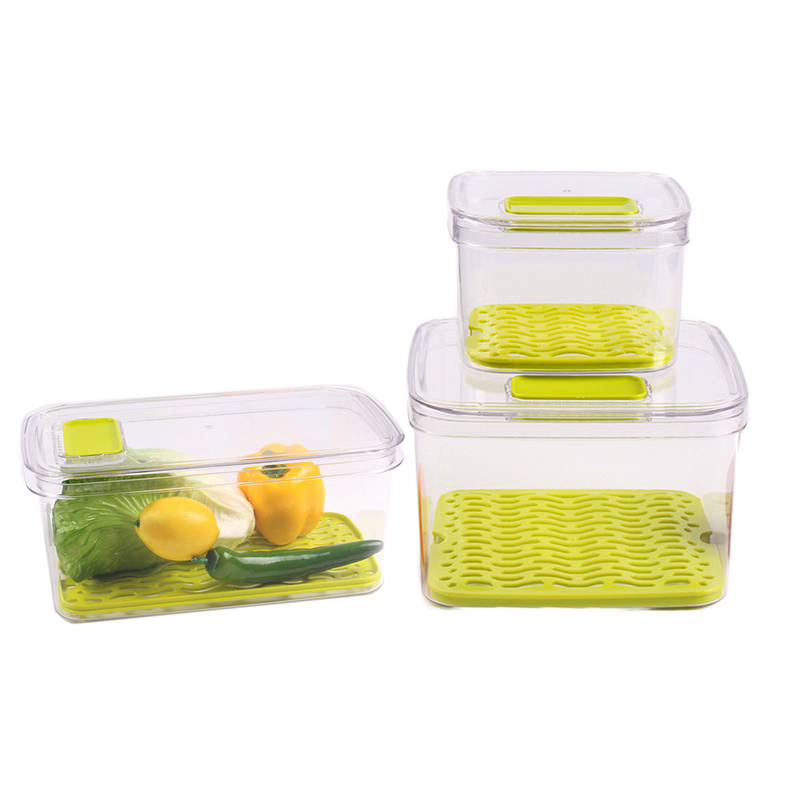 We 3 different vegetable keeper food storage container in 3 different types and shape. Keep produce fresh up to 80% longer with vegetable keeper and Saver. With its built-in Fresh Vent lid filter, these perfectly-sized food containers regulate the flow of oxygen and carbon dioxide to provide the best environment for maintaining fresh produce. With its built-in Fresh Vent lid filter, these perfectly-sized food containers regulate the flow of oxygen and carbon dioxide to provide the best environment for maintaining fresh produce—and longer-lasting produce means fewer trips to the grocery store, and more savings for you. The filter lasts a lifetime so you never need to buy replacements or deal with the hassle of installation. And the elevated Crisp Tray at the bottom helps keep moisture away, eliminating sogginess, and leaving you with crisper veggies and fruits. Transfer food from store container to this container without rinsing or cutting the produce; you’ll do that when you’re ready to eat it.